One of a kind, in stock now! 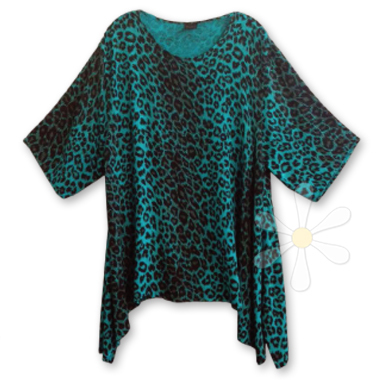 Our yummy jewel-neck tunic -- without the fringe -- in our fabulous leopard cat print dyed in gorgeous Maroc turquoise! You can cinch it at the waist with a wide Moroccan belt or contrasting sash or scarf, or let it fall dreamily over your favorite pants or skirt. For full details and measurements see the regular fringeless FEZZAH page.